Like many before me permit me to quote as follows: “ten children cannot play together for ten years”. This serves to officially inform you of my redeployment to Jos 1 Branch/CMU/CCU as BRC effective Monday 29th December 2008. It’s needless to say that I’ll miss Makurdi Branch (especially the under listed) but life must go on and I look forward to the greater challenges/new experiences ahead. My boss MR BAM, you were an excellent tutor, I’m forever grateful to have had the privilege to tap directly from your years of experience. To my HOP MR HENRY-Team spirited leaders like you are hard to find, keep up the good work sir. To my mummies MADAM HARRIET and MADAM ABIGAIL-your resilience in a tough working environment is commendable, keep the fire burning. To my ogas MR MOSES, MR EFOSA, MR AGADA and MR NIYI, I learnt from your wisdom in many ways than one. Thank you. DIBAL for your military lingua and ABIOLA for your “uniqueness”, thanks for the laughs. CANDID from UNN to NYSC Batch B 2006 Benue State days all the way to my first 2 months in Makurdi, thanks for being there. GAFAR, BUSAYO, AGADA O, RAYMOND thanks for the company; MARTHA, IDRIS you won’t be forgotten in a hurry. Thanks for everything, do forgive all my shortcomings. Much peace, love and respect! Yep it’s all Jos for me going forward. No worries, the Rock city ain’t no Gaza; just experiencing the curfew thing for now. P/S: if you ever find yourself in Makurdi try and (1) be at the Places and Times Night Club: had my first real regular clubbing experience there. It’s a four point fiver not at all like those bars where you’ll find people staggering in the name of dancing. (2) Chill out at the Exclusive Lounge wine bar. Great environment; good spot to chill and feel the Makurdi urban and upwardly mobile life style. (3) Eat at Treaties Buka. I should know, their meals kept me going. But you might want to avoid there when Lobi Stars Club Footballers are guesting. Men and their stomachs…you should understand. (4) Get around town, taking in the beautiful road network. Much like Abuja, one of the reason I love the place. 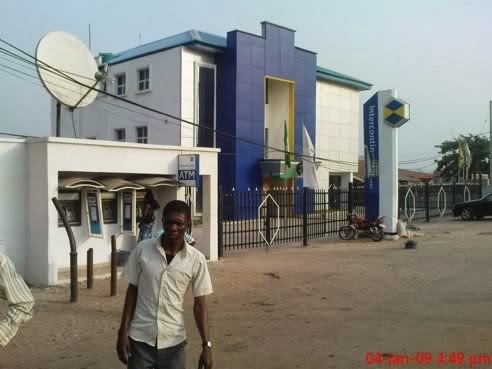 Makurdi Branch, the many months of renovation finally paid off.